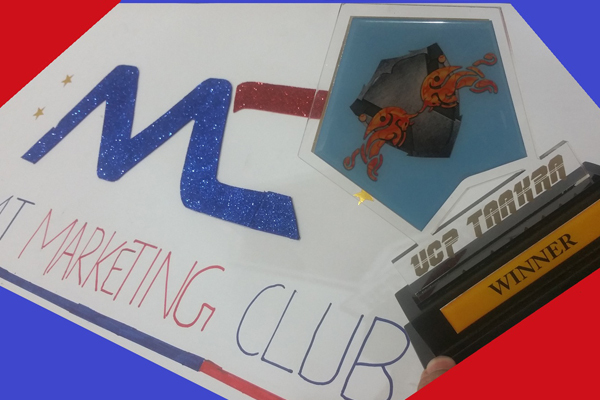 UMT-SBE students (members of Marketing Club and UMT Brand Lab) got 1st position among all competing universities at UCP-Taakra 2018. This event was held on February 21-25, 2018 at University of Central Punjab (UCP). Winning team consisted of BBA batch-50 participants comprising of Osama Niaz (President, Marketing Club), Sana Rana (Vice-President, Marketing Club), Shahzaib Ahmed and M Muneeb Akram. The title of this category was 'CreADive' a creative Advertising competition, where participants created a product (on theme of 'food fusion') and its business plan along with five advertisements from 1970 to 2010. Participants did a marvelous job of developing a product 'mixture of Ice-Cream and Gulab Jamun' named it 'Barfani Tashtari' (frozen spaceship) and an extended product line using cone ice-cream titled 'Toofani Kuppi' (storming cone). Advertisement used humor by showing an alien leaving the product on Earth. The product name, taste and advertisements were loved by judges.